I have been loving the "wearable technology" movement that is now developing. I have been doing lots of research and playing around with some raw materials, and this is my first completed project. 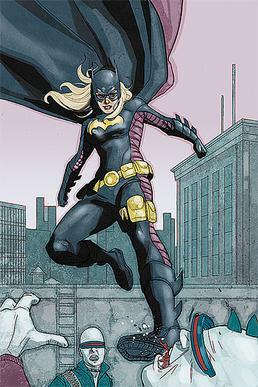 There are many incarnations of Batgirl, and this is the latest as worn by character Stephanie (I know she's had some tough storylines, now let her enjoy this costume) Brown! Since this bodysuit has those purple side panels I was able to eliminate the side seams that would typically be there.